"This one was a little less s#%@ty in my mouth." Aloha from Charleston, South Carolina. I just discovered the existence of F.O.M. and would love to join in the fun. I understand that I'll need to participate in the forums before joining, so I thought I'd start this post. I'm in the process of designing and building a portable tiki bar. The concept is that it will look like a pirate chest, but adorned with bamboo and teak wood, and will contain the trappings of a standard tiki bar, with rums, juices, tiki mugs, etc. I'd welcome any suggestions the community may have as to how it should look or what should go inside. Welcome to the Port! Can't wait to see pictures of your creation. A toast to my friends Roger and Rob. Aloha au iā ‘oe. Personal Statement: Leopard is a neutral. Aloha! I love Charleston. I'm just a bit north in Durham, NC. Cheers! I'll be sure to post some photos here once it starts taking shape. Intriguing.... so how big are you thinking? That sounds like it could get pretty heavy fast. I'm thinking of around 2.5 feet wide by 1 for deep by 1 foot tall, roughly. I was planning on using 1/2" plywood to keep some weight down. If I can only use one sheet, the weight shouldn't be too bad. Though the contents will add some heft. Yes, that's prudent. We have a plan on the back burner to convert an old sailboard into a bar top and build some sort of collapsible stand for it that will make it easier to move around. The board can go up on the roof rack. We take not taking ourselves very seriously very seriously! Aloha... Welcome... and congratulations on your wise decision to enter the port! You have just discovered F.O.M. So... how did it happen? As far as what to stock in your portable bar... what is your favorite tiki drink? Best to do these things in three's so...hmmm, Ah... what is your favorite flavor of Pie? All good questions Bohemian. I was googling the significance of the fez in tiki culture, and there was a post with a reference to the F. O. M. fez. That peaked my interest, and I googled F. O. M. I was amazed that there was a fraternal organization: 1) for people who loved tiki culture and 2) actually meeting and doing good works. I knew I had to get involved. My favorite tiki drink is Trader Vic’s recipe for the Fog Cutter. Not overly sweet, and has a real kick. I just downloaded Beachbum Berry’s Total Tiki app, so I imagine I’ll be expanding my horizons soon. Key Lime pie all the way! Location: Depends on what day it is. Personal Statement: Drink? Jet Pilot!!! Procrastination means you are free today and always have a project for tomorrow. Now that's got some style. That is one of those things that if you want one, you really need to build it yourself. 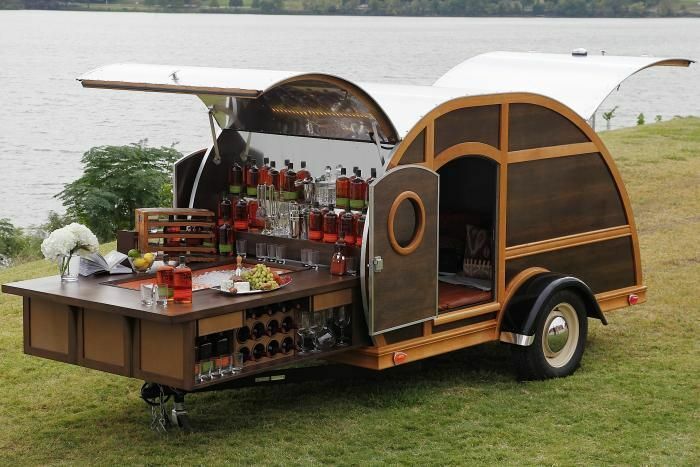 Teardrop camper with a flush floor RV slide out isn't rocket science. Then again, a hearst already has a sliding platform installed. You are the king of big ideas and over-engineering. Also why I want to be like you when I grow up. These are all wonderful ideas. 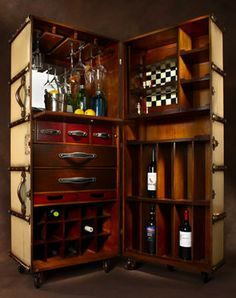 I'm hoping that my portable bar/chest will be a little more affordable than that. All things to aspire towards. I have been noodling on a PSV, Party Support Vehicle, since I saw Meatballs. Seriously, don't be surprised if Scroties' shows up as a converted carnival ride funhouse trailer pulled by a blue fire truck. You know type with the mirrors that make you look skinny and the air jets to blow up your lava-lava? How about an ambulance? Lots of fans convert them for NFL tailgating. I heard that California surfing enthusiasts would convert short wheelbase delivery vans for entertaining at the shore. It has been done at Burning Man in past years. The bar is uber tiki on the inside, too. I think it is now residing in Las Vegas. Finally was able to get started on the tiki bar pirate chest. Still a long way to go, but it's good to finally get started.